Lot # 12: 1872 Mort Rogers Boston (vs. Philadelphia) National Association Scorecard with David Birdsall on Cover - First Season of Professional Baseball - Al Spalding on the Mound for Boston! High-grade example of an 1871 Mort Rogers scorecard featuring a photo of Boston outfielder David Birdsall on the cover. 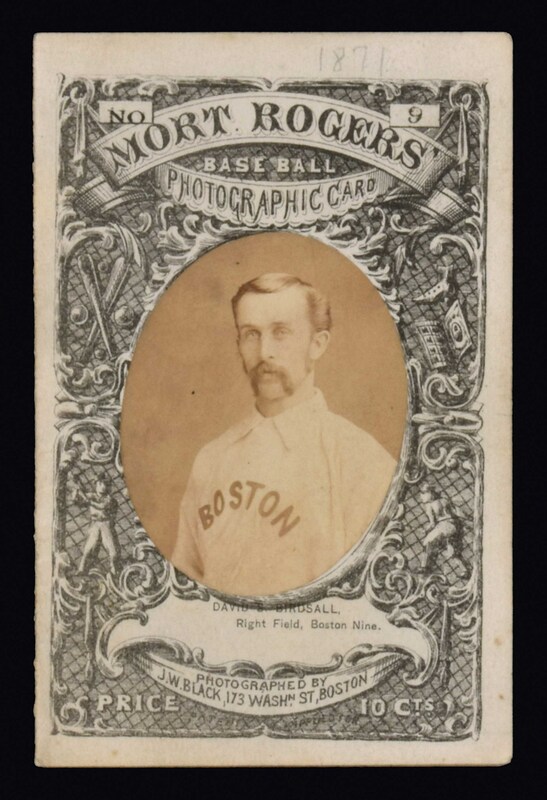 In the early 1870s former ballplayer and baseball entrepreneur Mort Rogers published a famous series of ornately designed scorecards for sale at Boston's South End Grounds. What set these cards apart from the standard scorecards of the era was the inclusion of an oval portrait photograph of a Major League player affixed to the cover. Today, Mort Rogers scorecards are not only exceedingly rare (we've handled only one other in the past fifteen years), they are also one of the most highly prized baseball souvenirs of any kind from the era. While they are clearly programs, Mort Rogers scorecards also have much in common with cards. The offered example dates from 1871 and, as noted, features a photo of Boston Red Stockings right fielder David Birdsall on the front. These ornately designed programs were obviously made with great care and one at a time. The stock is not thin paper, but instead is thick and "card-like." Birdsall's name, position, and team affiliation are noted in print below his image. Even the design of program declares it to be a card: "Mort Rogers' Base Ball Photographic Card" is preprinted along the top of the front cover. To the best of our knowledge, Rogers produced a series to 12 such photographic scorecards, each of which was numbered in the upper right corner of the cover (the offered scorecard is numbered "9"). The fact that these programs feature an actual photograph affixed to the front means that they were hand assembled, which almost certainly accounts for their modest production numbers at the time. The production costs were probably great, and that cost was passed on to the fans, as evidenced by the preprinted price of ten cents on the cover. Ten cents was an enormous sum for a program in 1871. 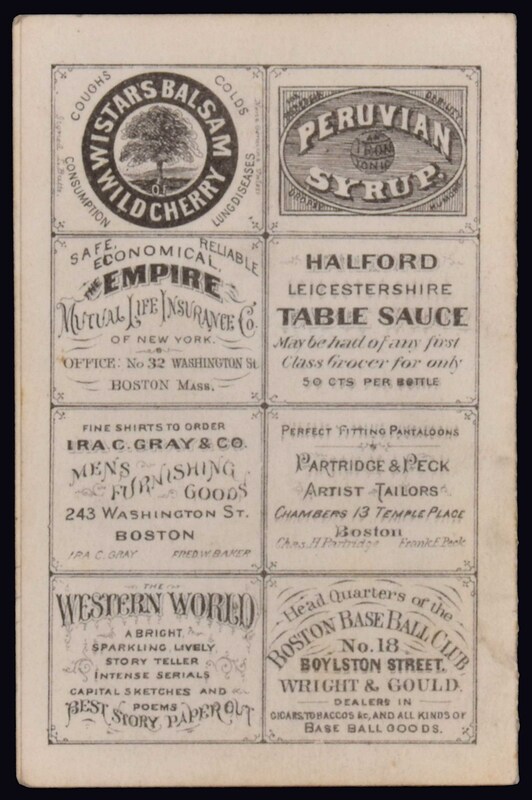 This scorecard was produced for sale at a National Association game played between the Boston Red Stockings and Washington Olympics on July 4, 1871, at Boston's South End Grounds. The handwritten lineups include an extraordinary gallery of great stars of the era, including Harry Wright, Al Spalding, Cal McVey, Dave Birdsall, and Charlie Gould for Boston, and Asa Brainard, Andy Leonard, Davy Force, Doug Allison, Fred Waterman, and John Glenn for Washington. Neatly scored in pencil to record a 7-3 Boston win. 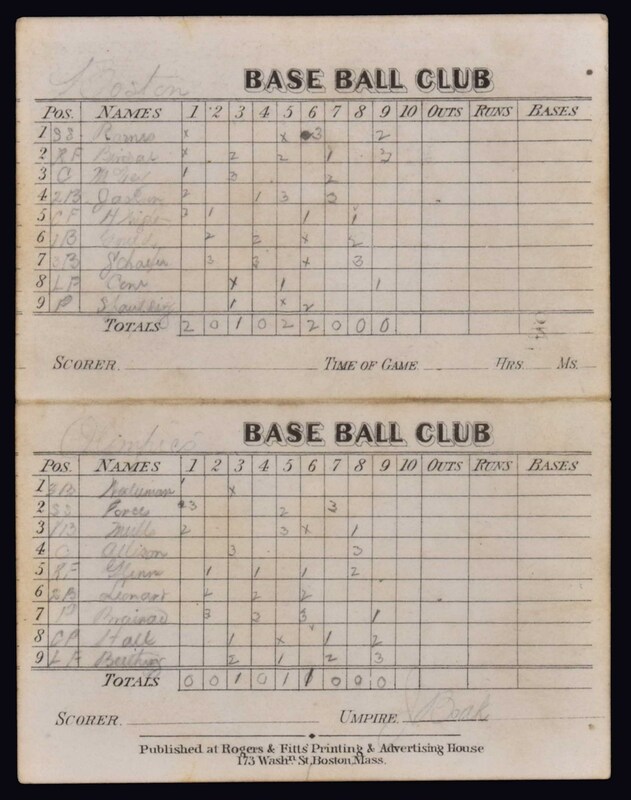 (Although the scorecard is not dated, research indicates that this game took place on July 4, 1871, and it is accompanied by a copy of a period newspaper article reporting on the game that includes the box score.) The National Association, which operated from 1871 through 1875, was baseball's first professional league, and all material relating to its short-lived existence is exceedingly rare. Mort Rogers scorecards are no exception and represent one of the most substantial and desirable items relating to the dawn of Major League baseball. This is one of only a few complete Mort Rogers scorecards we have ever seen (most examples found today feature only the front cover), and of those few is is It also one of the most attractive and the finest in terms of condition. The scorecard (3.5 x 5.25 inches) displays the year, "1871," written in pencil on the front and is otherwise in Excellent to Mint condition. Opening Bid $2,500. Estimate (open).